Apple today announced the launch of iTunes Store movie rentals and sales in Japan, offering over 1,000 movies in the initial catalog. Apple today announced that movies are now available on the iTunes Store in Japan giving customers an incredible way to enjoy movies on their iPhone, iPad, iPod touch, Mac or PC, or with the new Apple TV on their HD TV. Starting today, there are over 1,000 movies to rent or buy in high definition and standard definition from major international film studios including 20th Century Fox, Paramount Pictures, The Walt Disney Studios, Warner Bros. Pictures, Universal Pictures and top Japanese studios including Asmik Ace Entertainment Inc., Fuji TV, Kadakowa Pictures, Nikkatsu, Shochiku Company Limited and Toei Company Limited. Customers renting movies through the iTunes Store have up to 30 days to begin watching their rented content and 48 hours to finish once they have begun viewing it. 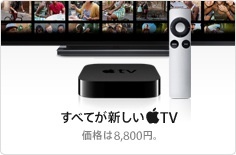 The company also announced that the new Apple TV began shipping in Japan this week, offering customers there an additional means to access the iTunes Store video content and other offerings.